Instant coffee has always seemed so foreign to me unless we're talking about using it in baking. Would you believe that I had never tried it as it was intended until last week?! 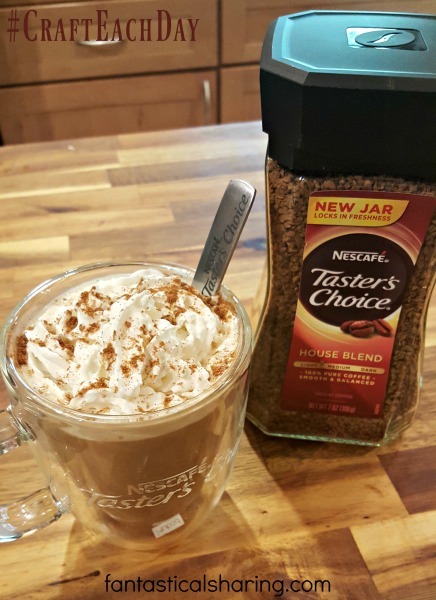 I was lucky enough to be chosen take the NESCAFÉ® Taster's Choice® challenge and I just have to share with y'all how that went. National Coffee Day is coming up on September 29th and I am celebrating in a new way! 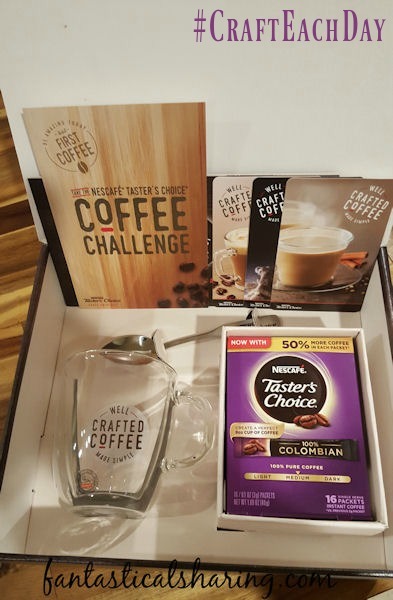 I received a mission kit from NESCAFÉ® that contained a package of the NESCAFÉ® Taster’s Choice® stick packs of instant coffee (in 100% Columbian roast - yum! ), a glass mug and teaspoon, an educational booklet, and THREE recipe cards - count them, THREE! 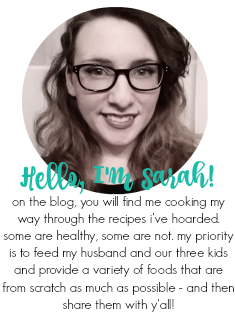 A challenge where I get to drink coffee, get a coffee mug (my addiction is real), learn something new, and make a few new recipes - if I wasn't already signed up, it wouldn't take much prodding. I did go ahead and run out to get the 7 oz. glass jar of their House Blend to save the stick packs for days where I need to leave the house. I do not work outside the home, my "work" is my blog and it's more of a hobby at the moment. However, I do have 3 children, 2 cats, a dog, and a husband and they do keep my day busy. Most of the day, it is just me and my littlest, Mason (who is 18 months old), at home. Most mornings I rush to get my coffee brewed and put creamer in it. It can be a struggle because Mason loves to climb and mess with everything first thing in the morning. If he were like his older siblings, I could set him in his high chair and give him breakfast, but he doesn't like to eat first thing in the morning. So it's a rush to get my coffee while keeping an eye on him and while both cats are underfoot meowing because they are starving. 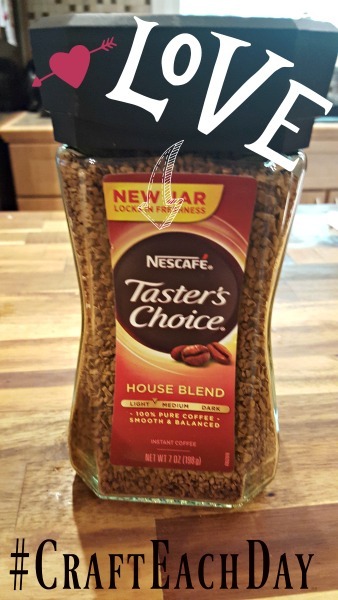 This past week, I took the NESCAFÉ® Taster’s Choice® challenge and instead of brewing my one cup of coffee, I was able to use the instant coffee by adding just hot water - no waiting. I already love the convenience of the instant coffee! Instant coffee isn't the only new thing I tried this week - I have never had NESCAFÉ® brand coffee before. I am pretty open to new things, so I was looking forward to trying their coffee. I love that my mission kit came with an educational booklet. I got to learn more about NESCAFÉ® as a whole and why their product is so well-crafted. They use responsibly sourced beans, carefully roast and brew their beans for the best flavor, and flash freeze to lock in that perfect flavor. I also love that they are working with coffee farmers to combat environmental issues that threaten the future of coffee. NESCAFÉ® Taster’s Choice® comes in six varieties: House Blend, Decaf House Blend, French Roast, 100% Columbian, Hazelnut, and Vanilla. And having your morning cup of joe is as easy as adding water! It's that simple. You can purchase both the stick packs (that are for 8 oz. cups of coffee) or the glass jar that holds 7 oz. of coffee deliciousness (an upgrade from the old plastic packaging to help keep the coffee fresh) in any of the six flavors. 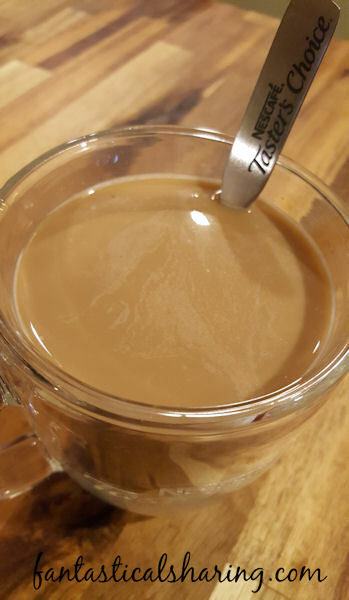 I personally loved the glass jar because it's easier to add just the right amount of coffee to make a 10 oz. cup - which is my favorite. But the stick packs are incredibly convenient for on-the-go cups like I needed this morning when I had a doctor's appointment. The 100% Columbian blend was the one I tried first and I loved the bold rich flavors paired with my favorite creamer. I purchased the House Blend because I favor light roasts and the House Blend was smooth and mild. It's definitely my favorite of the two, but I cannot wait to try more. I served my House Blend cup topped with whip cream and pumpkin pie spice - yum! Morning cup while finalizing my grocery list! 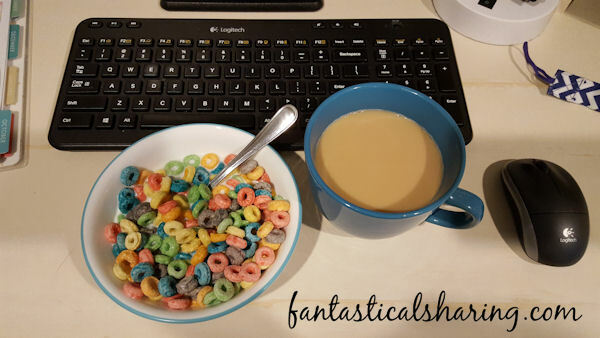 Early morning blogging and because I'm an adult, I'm having a bowl of Fruit Loops with my coffee. And be sure to check out the different recipes on their website. 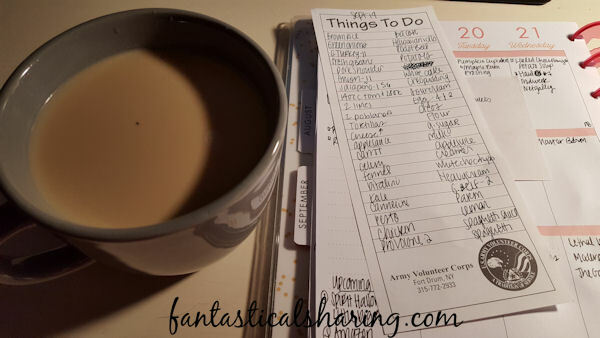 My mission kit came with recipes for Creamy Caramel Latte, Iced Coffee, and Chai Coffee. Last weekend was ultra busy and this one is supposed to be too, so I'm not sure I'll be able to make one of them, but they are definitely on my to-make list, especially the Creamy Caramel Latte. I already have plans to concoct my own pumpkin spice latte since the local stores are out of everything pumpkin and coffee and it makes me so sad! What are your thoughts on instant coffee?